Sunny the meerkat lives in the Kalahari Desert, and he does not appreciate the hot, dry weather there. His family’s motto is “Stay safe, stay together,” but Sunny sometimes feels his siblings are too close to him. He thinks there must be better places to live, so he leaves an explanatory note for his family and sets off to visit his mongoose cousins. Sunny’s first stop is at Uncle Bob’s, where the African red hornbill warns the mongoose family if a jackal is lurking. Sunny feels that he doesn’t quite fit in there, so he drops in on his cousins Scratch and Mitch. Their family, however, is moving house, so Sunny visits some chickens on a farm. Since he isn’t keen on eggs he is soon off again. This time he stays with his cousins Mildred and Frank, but it’s pouring with rain. Sunny continues his travels and arrives in Madagascar on Friday evening. He is so afraid of the dark that he decides to go and visit Aunt Flo. Unfortunately she lives in a marsh where it is both dark and wet; Sunny is desperately unhappy there. On Sunday he finds himself in a place where the weather is extremely hot and everyone seems to be very close. Sunny has in fact arrived home, and he realises that it is the ideal place for him after all. 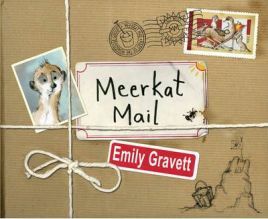 Emily Gravett has created a delightful picture book in Meerkat Mail. The storyline may not be the most original one, but the way it is presented makes for an outstanding book. When Sunny leaves home he promises to write, and each time he arrives in a different place a postcard is attached to the page; in all, there are six postcards. Each one is beautifully illustrated and is attached down one side so that it can be turned over and read. The postcards all have stamps and postmarks drawn on them and, except for the final one, addresses written on the right-hand side. There is text from Sunny, sometimes accompanied by little sketches; one postcard has pieces nibbled out of it, supposedly by termites. Mentions of the Kalahari Desert and Madagascar provide an opportunity for learning a little geography, while the meerkats, mongeese, jackal and red hornbill will allow children to learn about the wildlife of these places. The text of Meerkat Mail is in a medium-sized, clear font and is usually superimposed on a light background. There are a few pages where the text appears in white on a black background, and in just one case it is in black on a grey background. There shouldn’t be any difficulty deciphering it. The main narrative text is never more than three or four lines per page, and sometimes only one or two. The vocabulary is straightforward on the whole. Added to this of course is the text on the postcards. An adult reading aloud to a very young child could omit reading the postcards if the child has a short attention span. Older children, however, will enjoy reading the postcards themselves as they contain a fair amount of humour; when Sunny encounters the termites he ends his postcard “Yours ticklishly.” The messages on the cards look as though they really have been written by hand and are full of imperfections that add to their charm. Emily Gravett has provided the illustrations for Meerkat Mail herself and has imbued them with creativity and humour. The frontispiece is made to look like an old photograph album showing Sunny and his family; at the back of the book the ‘photos’ show the relatives Sunny met up with on his journey. Although the majority of the story takes place in a sandy desert and there are episodes in dark, rainy places, the atmosphere never seems boring or gloomy. The postcards do of course add interest and brighten things up, but the scenes of the animals bring the illustrations to life too. The mongoose family moving house have a cooker, bedside lamp and bedstead crammed into a red wheelbarrow; other members of the family lead the way, struggling with bits of furniture. Readers cannot help but sympathise with Sunny when they see his younger brothers and sisters piling sand around him and one sits on top of his head brandishing a flag. No wonder he was fed up. Meerkat Mail is a picture book that could appeal to children from the age of three right up to nine or ten. It can provide enjoyment purely as a story for young children listening to an adult reading while they take in the pictures and turn over the postcards. Older children who are independent readers will learn a little about animals in the desert or the marshes while finding plenty of amusement in the messages that Sunny writes to his family. The pages of the book and the glossy postcards are of a high quality and should stand up to plenty of wear and tear. Meerkat Mail is a book that any family with young children should seriously think of adding to their collection. It is likely to give pleasure over more than the average number of years. No Comments on "Meerkat Mail"